I loved these light blue plates, they were so pretty and well priced but I had to leave them there, because I already have plates, darn it! I don't know about you, but every trip I make to ikea I seem to go through the same crazy pattern. BUT HEY! it was so much fun! After going through the whole maze (as fun as it was), I was ready to go! i've been to ikeas in iceland, philly, atlanta, and here in orlando. 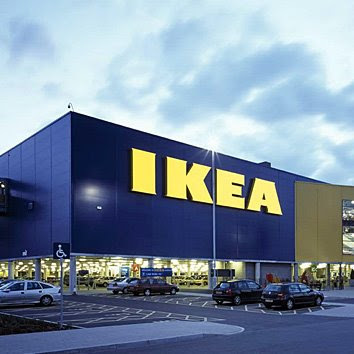 i've even seen one in paris..i'm inspired by the modern simplicity that ikea offers. we have renovated several investment properties with entire ikea kitchens, but i'm with you..
it is overwhelming and tiring. we love those swedish meatballs! That so easily happens at IKEA! Fortunately I do not really like shopping that much and the trip to IKEA is just a boring 45 min highway ride. I did get awesome curtains there the last time I went. hahha! ikea madness strikes again! i do the same exact thing! and the ikea in burbank has the worst parking scene on PLANET EARTH, so i usually just end up buying what i can hand carry. thankfully that isn't all that much, so i usually don't spend all that much! I do the same! And sort of do that at Target also. I go nuts and then I put a bunch of stuff back. :) I love the Swedish meatballs there... and the cookies too. I also <3 Ikea... Love the siggy by the way. don't forget to sample the chocolate! i lived in sweden for a year and their chocolate is amazing..."marabou"
That food is from ikea? I'm very impressed. We've been to Ikeas in Baltimore, MD; College Park, MD; Woodbridge, VA; King of Prussia, PA; Houston, TX; Dallas, TX; Round Rock, TX; Atlanta, GA; Orlando, FL; and most recently here in Tampa, FL. Within the next 12 months, we hope to visit IKEAs in Ft. Lauderdale, FL and Charlotte, NC. Even when we go to IKEA "with a list" we still end up taking longer than we expected...and yes, something about the store makes people hungry.